(nee Equitz), of Germantown, formerly of Mequon. February 2, 2019 age 97 yrs. Beloved wife of the late Frederick. Loving mother of Dennis (Carol) Mueller & Dr. Jeffrey Mueller. Special aunt of Karen (Ted) Cole, Raymond (Heidi) Runge & James (Nancy) Runge. Dear sister of Betty Fleis. Preceded in death by other brothers, & sisters. Further survived by 4 grandchildren, several great grandchildren, 2 great great grandchildren, & loved by many other relatives and dear friends. Memorial service Saturday Feb. 9, 11 AM at Trinity Ev. Lutheran Church West Mequon, 11450 Wauwatosa Rd. Mequon. In lieu of flowers memorials to the church appreciated. 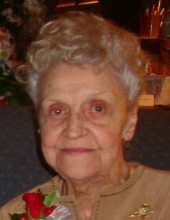 To send flowers or a remembrance gift to the family of Dorothy Edna Mueller, please visit our Tribute Store. "Email Address" would like to share the life celebration of Dorothy Edna Mueller. Click on the "link" to go to share a favorite memory or leave a condolence message for the family.